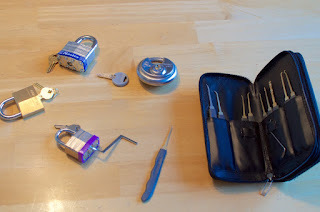 I've been curious about picking locks for many years but I've just never done anything about it. Until now. It's frustrating so it requires patience. It's exciting to have the lock pop open suddenly. I hope to be able to break into my own house some day. Wondering how this is going. Just got myself a set of picks for Christmas. Always been able to rake open cheapo padlocks. Wondering if there are enough people interested to set up some sort of locksport challenge at Spark. It's going slow, mainly because I haven't been able to devote a lot of time to it. And when I do, I am not consistent. I spent three hours in a car and couldn't open any of the three locks I brought along. Maddeningly frustrating. Then on the trip back I was popping all three open in minutes. A lockport challenge would be cool but I'd be playing just for fun.